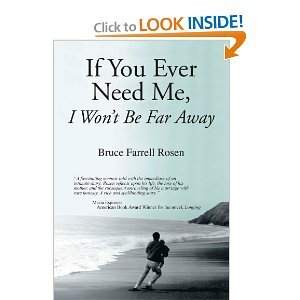 Bruce Farrell Rosen tells his life's journey in a compelling, honest and poignant fashion in his memoir, If You Ever Need Me, I Won't Be Far Away (Alma Rose Publishing, 2011). Written with the intimacy of a diary, he openly writes about his life, his struggles, his loss, his love, his lessons learned, simply his journey to the person he is today, a financial adviser by day and a writer by night and a father of two. This and more is in Bruce F. Rosen's memoir If You Ever Need Me, I Won't Be Far Away. Even though If You Ever Need Me, I Won't Be Far Away fully displays the tumultuous times in the authors life, it ultimately reveals the lessons learned and joy that life can bring. There was a reference in the press releases I received that explained these memoirs as in a similar fashion to the book and movie Eat, Pray, Love, and I believe that to be true, he pulls both traditional western and traditional eastern philosophy and spirituality into his learning, soul searching and writing process. I found If You Ever Need Me, I Won't Be Far Away to be well written and easy to read, so don't let it's 620+ pages intimidate you, it read quite fast. It is a bit unique in the sense that sort of combined his personal story with "essays" if you will of current events that were taking place at the time of his writing, but somehow it just all worked together. If you enjoy memoirs, particularly those where the person overcomes obstacles and discovers life lessons and themselves along the way, If You Ever Need Me, I Won't Be Far Away is a great book for you! Thank you to If You Ever Need Me for my sample used in this review, opinions are honest, review by Michelle.